Well, Sydney put on its best heat wave weather for East Coast this year with hot and humid days and nights. Our Italian judge, Irina Stigler had just come from a European winter but she loved the warm weather, although the finals night heat on the arena floor was challenging. Ajay Samurai owned by Donna Francis,Champion Arabian Pony Stallion. 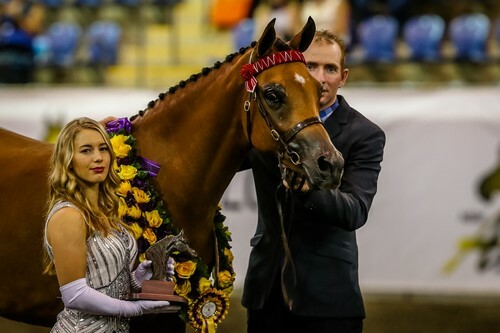 Baring Court Javali Triple Crown Winner and Champion junior Arabian Pony Gelding, Akehurst and Patterson. 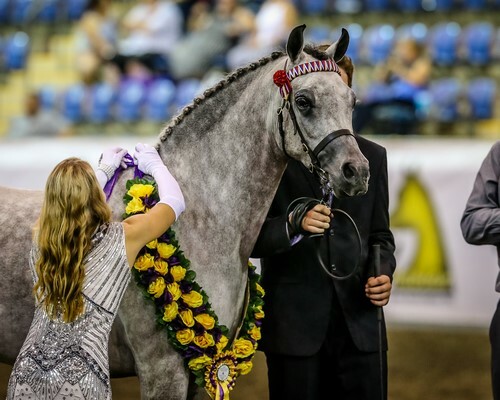 Crackerjack owned by Sue and Ralph Oberg East Coast Champion senior Arabian Pony gelding and Triple Crown winner. Thorwood Absolutely Fabulous B Sheply and S Cole Champ Arabian Riding Pony Filly 2 yrs. 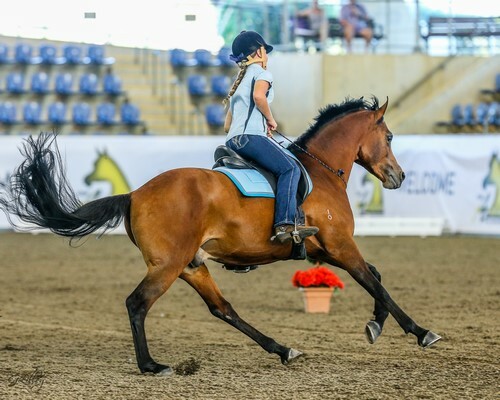 Wednesday started with the very well supported dressage classes, while Thursday and Friday devoted to Arabian and Derivative halter and Saddle classes. 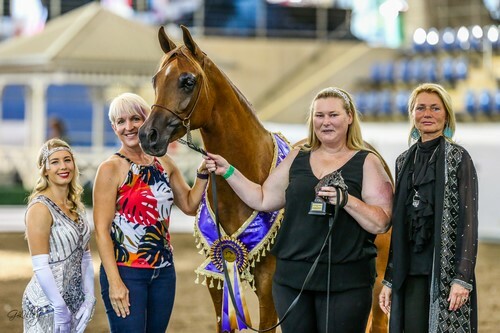 The ever popular liberty classes and freestyle ridden class had lots of quality horses for our judges Sharyn Hungerford (Queensland), Kerry Wilson (Western Australia) and Cathy Padgen (New South Wales). 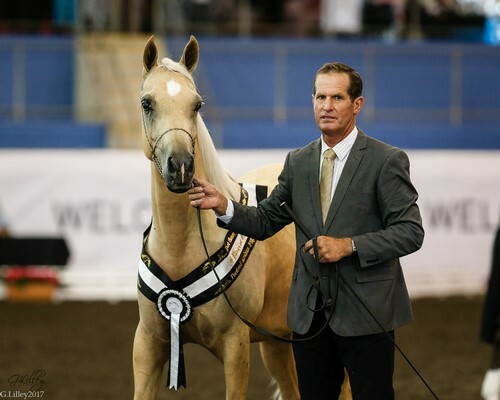 Diamond Road Blonde Ambition-Diamond Road Arabians Reserve Champion Partbred filly 2 & 3yrs. Excalibur Park Hallelujah-Excalibur park-Champion Anglo Filly 2 and 3 years. 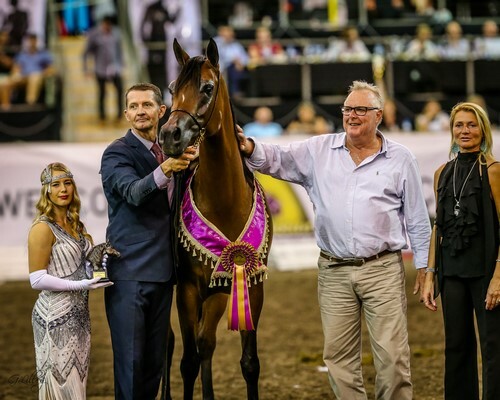 Friday night saw the Camelot Challenge taken out by Summa Crockett and Top Model (Ray of Light x Faith in Kate), who has been a very successful halter horse and is now starting her saddle career. 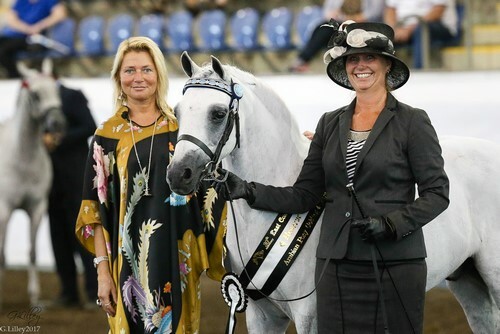 Grand Champion Saddle Horse of the show was the lovely part-bred stallion Cheval de Luxe (FS Champion de Luxe x Dancing Flower), who is also a very successful dressage horse. 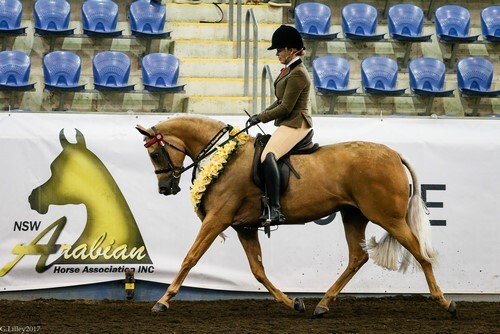 Purebred gelding Just My Jullyen and Tahlia Perry riding bridless in the opening ceremony. Top Model & Summa Crockett winner of the Camelot Challenge. Saturday was all of the youth and non-professional classes. 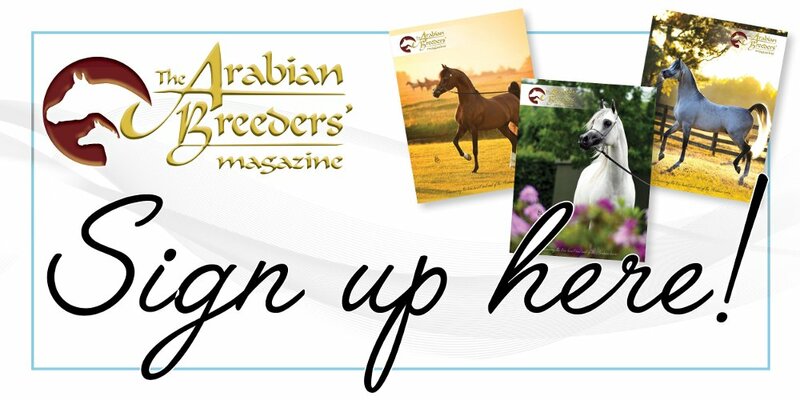 There was also an exhibition race between a thoroughbred and an Arabian, with a very informative talk on training the Arabian racehorse. 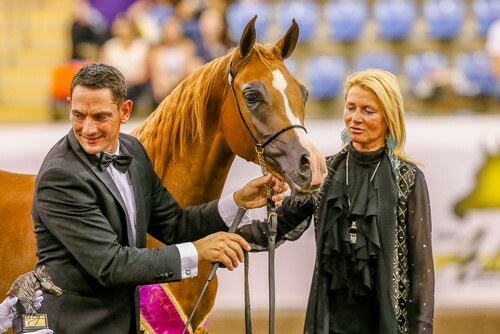 Our judges arrived for Saturday finals night in style in a baby blue convertible Mustang and a great display was put on by purebred stallion Fire Alert (TS Al Malik x Fire Flame) with the Australian flag and Fire’s Court Jester (Fire Alert x Jezzabeel) as a stockhorse. 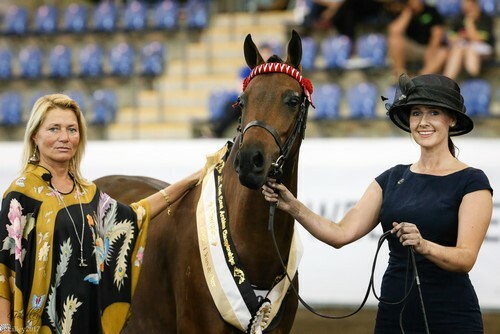 Tahlia Perry and the purebred gelding Just my Jullyen (Gai El Jullyen x Myriad Park Krystelle) wowed the crowd, riding bridleless throughout the ceremony. 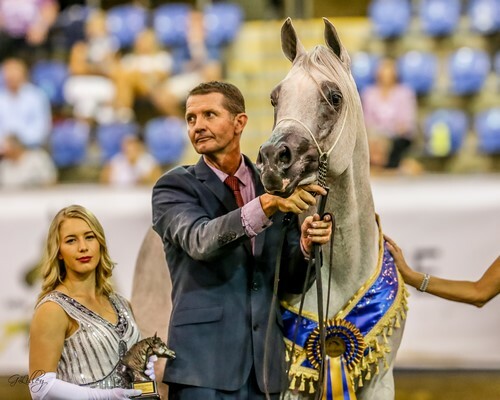 The eagerly awaited purebred halter classes had quality horses and a strong line up of mares for the new Queen of Sheba Award, presented in remembrance of the late Gloria Lanigan. This was won by Niarla Angel of Zanadik (Niarla Shakla’s Zanadik x Mirabee Niaal Jylraz), owned by Trish Arnold. 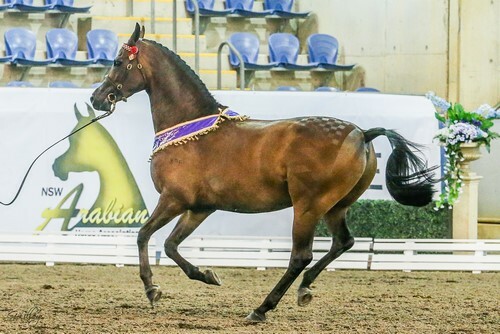 Broodmare Champion was Oso Xannya (Hun x Danaes Zenia) for Oso Arabians. 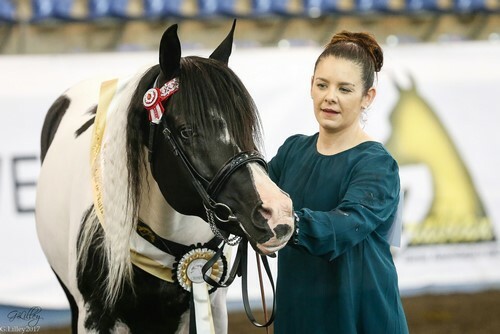 Chelleason Bey Jullye-Anne (Gai El Jullyen x Briarwoods Bey Savannah) won the seven-years plus title for Jess Wilson. 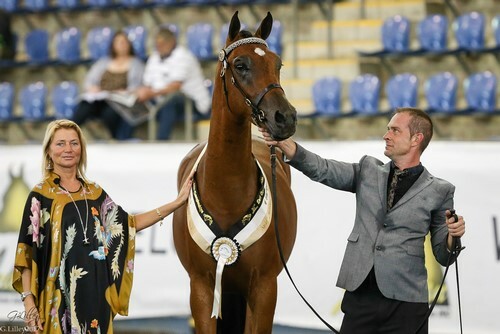 The Champion Stallion Seven Years Plus was RHR Heir of Marwan (US) (Marwan Al Shaqab x LC Psychesheiress) owned by Diaa Kara-Ali. 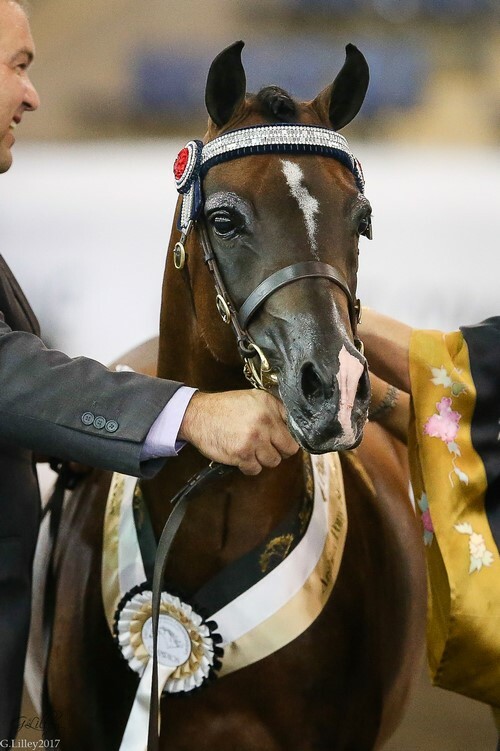 Another US import, Pshalomar (Shanghai EA x MC Psynammon) won the Champion Stallion Aged Four-to-six Years for Hideaway Farm Arabians. The full sisters Venice MI and Venecia MI (Allegiance MI x Valentine MI) took out the Champion Yearling Filly and the Two-year-old Champion Filly for Mulawa Arabian Stud. 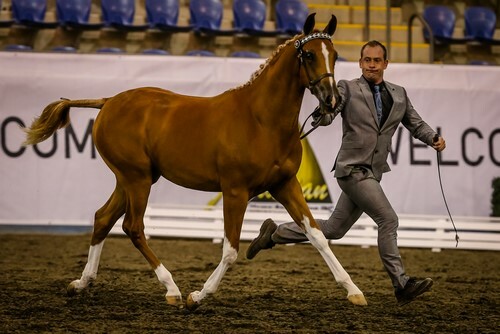 Marwans Jewel in the Crown MPA (Echos of Marwan x Aulda Shakhira) won the three-year-old filly title for Myriad Park. Echos of Tomorrow (Echos of Marwan x Falzon Tomorrow’s Dream) continued on his winning ways with the Champion Arabian Colt Two Years title. 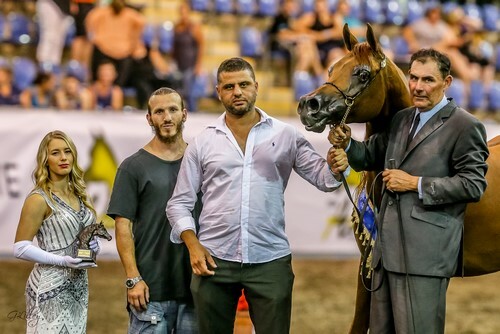 Kavalier MI (Marwan Al Shaqab x Karess) won the Three Year Old Colt title Mulawa Arabian Stud, while Maximino (Maximilliano x D’Amors Sensational Fame) took the Yearling Colt title for Francis Park Stud. 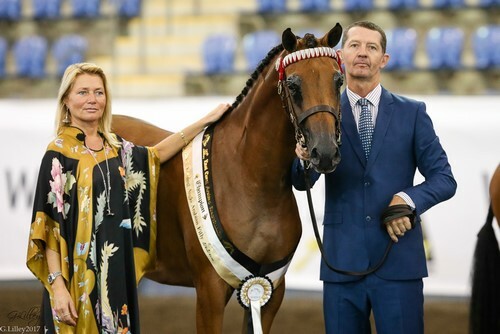 The geldings saw Engage MI (Allegiance MI x MI Klassic Fantasy) win the yearling title for Mulawa Arabian Stud, Zayerra RR (Echos of Marwan x Zeahne) take the two-year-old section for Rockridge Arabians, while Sharjah WPI (Jadaan Al Shaqab x Sophia WV) too the three-year-old section for Khalid Arabians. The four-to-six-year group was won by Makehim Jull’d (Gai El Jullyen x Makerher Jazz) for Belinda Radcliffe. 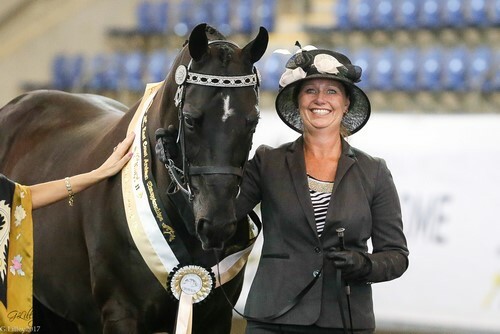 Breeder Katie Smith was very excited when Riddick (Armageddon x Shaylen Park Mia Amore), owned by Cheryl Edwards, won the senior purebred gelding award. 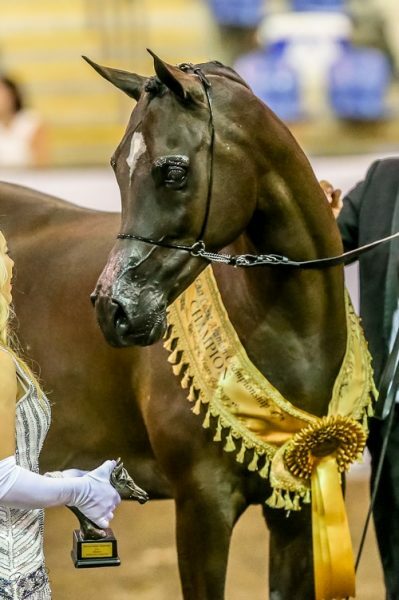 Naaman Georgia-Naaman Stud-Champion Yearling Anglo Filly. 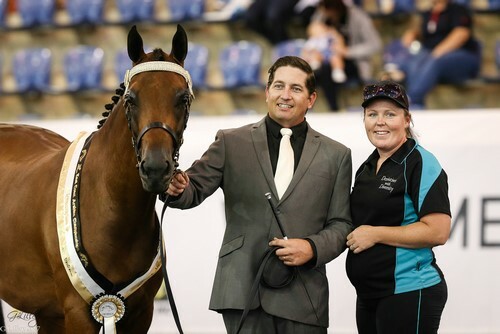 Aloha Kings Realm-M Eather-Champion Anglo Gelding led and Triple Crown winner. 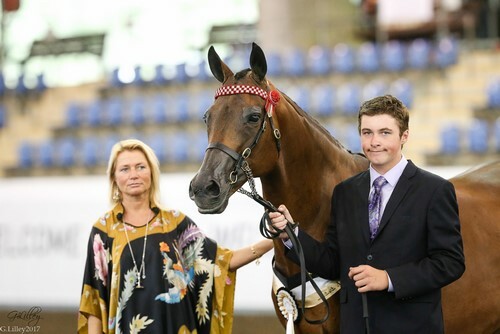 Aloha Stars and Stripes, Jess Kent Supreme Arabian Stockhorse led. 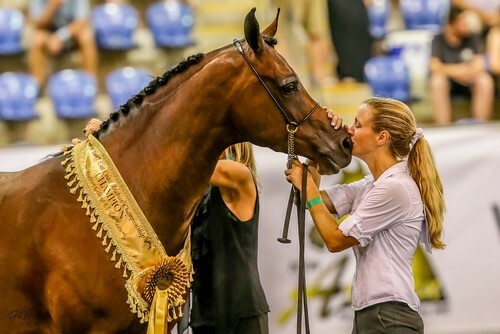 Kinful Just Dynamite-L.Lamberley Champion Arabian Warmblood Gelding 2 & 3 years. 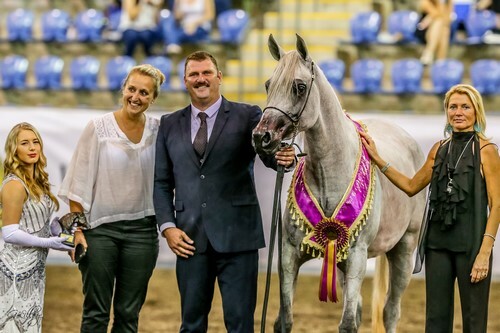 Koora-Lyn Rhythm Reserve Champion Senior Arabian Pony Gelding-M Eather. 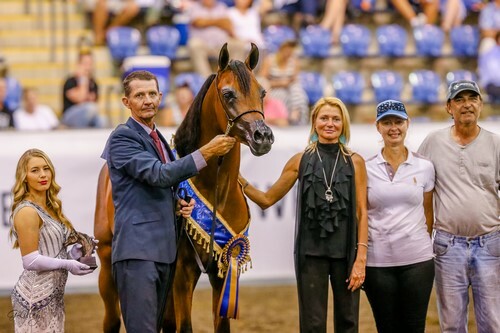 Uhavta Lemaire, Erin Montford Champion Senior Arabian Riding Pony Gelding. 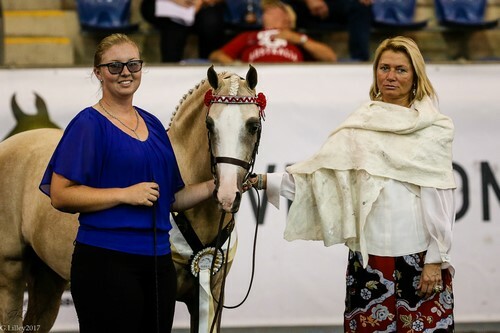 Sharinga Spellbound, S & R Oberg Champion Anglo Arabian Mare. Big Valley Yours Truly, Arpege Pak Stud Champion Quarab Stallion. 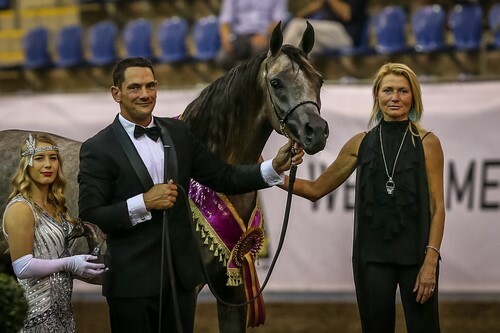 Next articleArabian Futurity Europe raises record amount!